Paris 1913. One of Europe’s leading population centers was also a cultural and creative core with the Avant Garde art movement at its peak. It was the “glory year” for modern art of the time, when artistic greats such as Marcel Duchamp, Henri Matisse and Pablo Picasso took their modern art out of the studios and into the streets. Vahan jewelry has its roots in this artistic breakthrough in Paris that eventually made its way to the US to become a Made in America success story decades later. MATTHEW’S JEWELERS brings this designer’s historical influences, time-honored creativity, and fashion-forward jewelry designs to their Mother’s Day “Perfect Pairing” trunk show, May 10th and 11th. Delight in meeting Nathalie, Sacha’s wife and C.O.O. 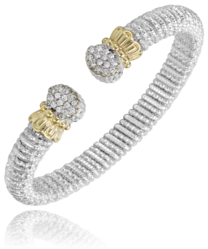 of Vahan and have her work her styling magic on you! Sacha Der Calousdian was born in southern France and raised in Paris. Before he established Vahan in 1968, two generations of designers came before him. Sacha’s grandfather Manasse started his own luxury jewelry company in the late 1800’s. That business was later taken over by Sacha’s father Arsene Der Calousdian in the 1930s. As a boy Sacha’s curious nature lead to the exploration and eventual discoveries of his father’s and grandfather’s chosen calling. And, as a young man youthful inquisitiveness turned in to true passion for jewelry design. He then attended La Chambre Syndicale de la Bijouterie, one of Paris’ most respected jewelry design schools. But his schooling wasn’t just about design. Sacha explored a number of other fields of interest including architecture, fashion, painting, sculpting, vintage car restoration and exotic travel. During the 1950’s to the 1960’s, Sacha designed jewelry for fashion house Hermès and jewelry designer David Webb. After two decades of designing jewelry for other firms, Sacha started Alwand Vahan Jewelry in 1968. His jewelry made a big impression with luxury goods maker Bergdorf Goodman. He soon went on to manufacture his collections for Bloomingdale’s, Neiman Marcus, Mayor’s and several other major retailers. In 1973, Sacha’s wife Nathalie joined the company serving as the COO handling customer relations. Together, the couple has worked to produce lines of designer rings, necklaces, pendants, earrings and bracelets. 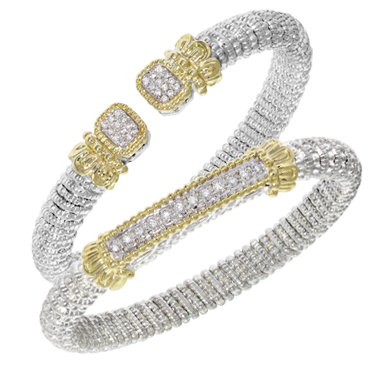 In 1994 and 1995, Vahan began production of their Moiré Beaded stacking bracelets, a line of items that has since become their most widely demanded. Vahan jewelry is as versatile and fashionable. Today’s women want jewelry that keeps pace with their busy lifestyle. 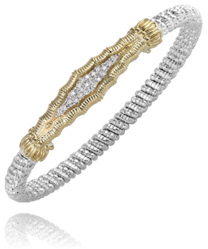 By combining 14-karat yellow gold with sterling silver, Vahan’s two-tone designs seamlessly move from work to casual. 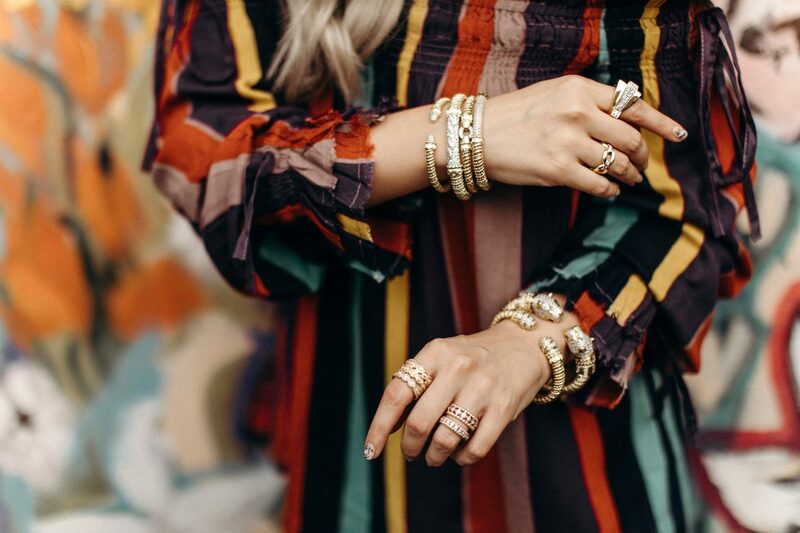 Stacking and layering are the leading jewelry trends today. And, Vahan jewelry always has the answer to “what should I wear today” when it comes to accessorizing with jewelry. Given the “no rules” approach to fashion accessories for today’s women, stacking bracelets can take many forms with Vahan bracelets. A luxurious 12mm bracelet has the stature to be worm on its own or can be complemented with a thinner bracelet or two. Try the black and white trend by wearing bracelets set with pearls and onyx. Coordinating palette passions with a variety of fine colored stones are other possibilities. The options are endless! You Can’t Just Have One! 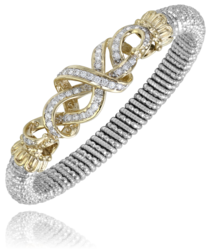 You will learn quickly that with Vahan Jewelry, the more you stack, the better the look can be! Seven bracelets easily style–all done in 14k yellow gold with diamonds. Add one at a time, and with each addition, the look gets closer to perfection! The weight of all the bracelets when worn all together actually has an indescribably comfortable feeling. Friday and Saturday, May 10th and 11th. Enjoy 20% Off all jewelry and watches*.